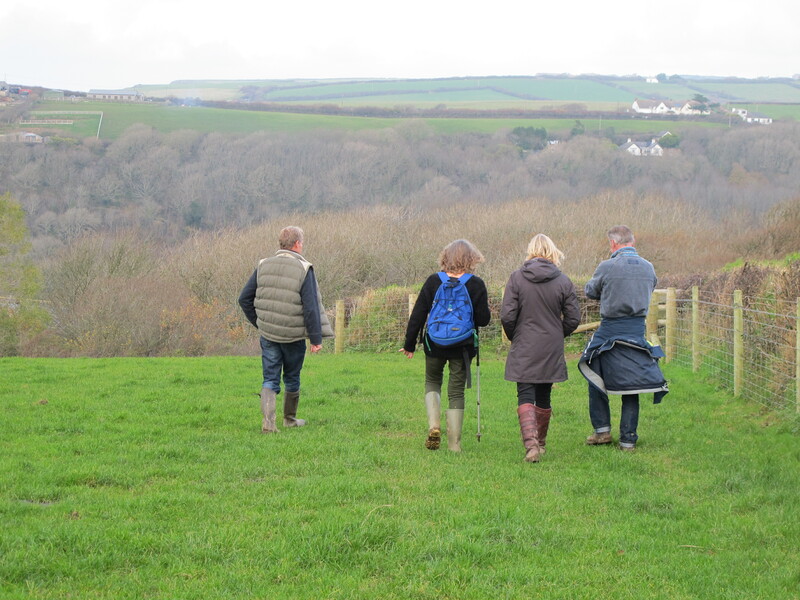 Walking the Footpaths in a Cornish Village | Notes from the U.K. This entry was posted in Walking and tagged Americans in Britain, Americans in England, Britain, Cornwall, footpaths, Madonna, rambling, walking by Ellen Hawley. Bookmark the permalink. Rambling and pubs…2 great reasons to love England! You’ve got your priorities straight, then. It still amazes me, after more than eight years here. I still haven’t gotten my boots clean. I should’ve put them in the stream along with the dog. Beating the bounds is a popular activity where boundary stones and occasionally children are whipped to imprint the territorial map on the inhabitants, is this similar? No children were harmed in the making of this walk. And since we split the paths up among five groups, it didn’t take as long–which is a good thing, given the length of the days just now. Somebody organized a beating of the bounds a year or two back, didn’t they? i would love to walk these paths to absorb the history. They are wonderful. When the weather gets better, I should see if I can’t post about some of the walks around here–the abandoned quarries, the remains of a medieval village, all the things they pass that are easy not to recognize until someone points them out. Thanks for making me think of that. I would love to see the photos! It shall be done. But not until the days are a little longer and (with luck) the weather’s better. I’d love to see the historic photos, too. Wish we had something like that in these parts. The ability to walk cross country without fearing trespass. One thing though: there’s actually a time before pubs? Huh. Okay, that bit about a time before pubs? That’s guesswork. Hmmm. Gee. Should I approve this comment or not? Oh, hell, I think I’ll hit Approve. Sounds like a fun event! By a curious coincidence, this is the second post I’ve read today about these British footpaths; the other post was published earlier, but I didn’t stumble upon it until this afternoon. I found the bit about Madonna’s battle over the footpath especially interesting. I am so, SO longing to spend some time in England and associated isles! I had a couple days in London, which was lovely … but I was en route from Johannesburg to Seattle to meet Himself for the first time and so I wasn’t paying quite as much attention as I would now. London’s wonderful, but if you have a chance to see some of the countryside, it’s a completely different thing from London. We had a wonderful hiking vacation through the Scottish Highlands last year and yearn to do the same in England sometime soon. We were told that in Scotland one cannot ban another from rambling through their property. True or not, I don’t know…. True. In Scotland, you can walk anywhere. Here you need to follow the footpaths, but for the most part I haven’t minded since the paths keep me from getting hopelessly lost. We did have to leave the path and cut across private land once when being on the edge of the cliffs got to me and I wasn’t willing to either go on or go back. We met the farmer whose field we were crossing and both apologized and explained and he was fine with it. It’s on my to-do-list! 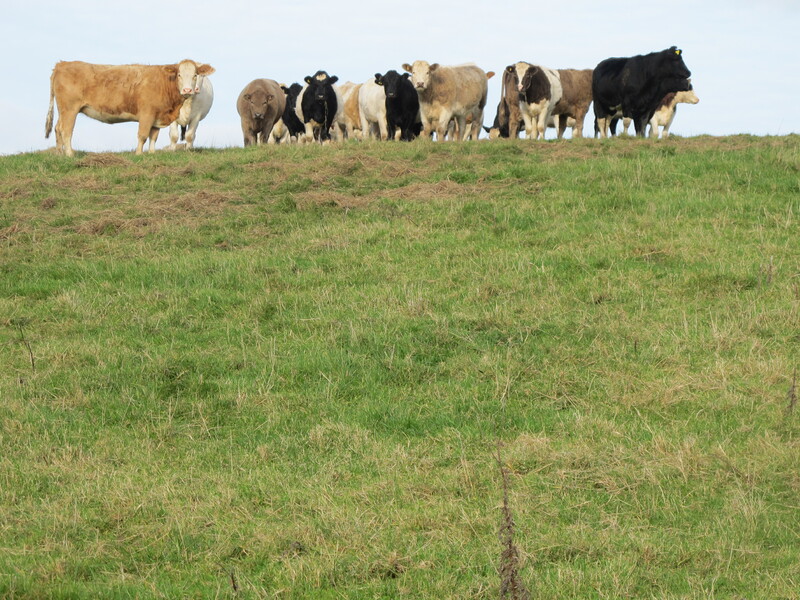 Prefer those roads where you meet cattle instead of cyclists … it looks a little like the south of Belgium, hilly and green. I haven’t seen Belgium, so I can’t compare it, but it’s definitely hilly, and a wonderful combination of wild and settled. I had absolutely no idea that things like this existed – in the US, we’re far too possessive of dirt to allow common walkways through the countryside. We’ve even started to gate access to public parks and nature reserves so the someone can charge admission. The footpaths blew me away when I first understood what they were. But really, they go back (as far as I understand it) to a time when they were the highways and feet were the transportation. For all I know, they may date back to before private ownership of land. And somehow they’ve been preserved–or some of them have. I know many have been lost. I grew up in New York and took it for granted that grass was fenced off to keep people off it. Yes, it is insane.